With over 13 years of experience, Best Stainless supplies 15-5 ph stainless steel for a variety of industries including aerospace, petrochemical, and pulp & paper factories. 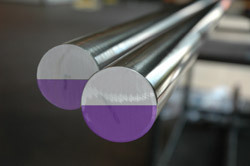 Stainless Steel 15-5 is a precipitation hardening martensitic stainless steel designed to have a greater toughness than 17-4 ph stainless steel. It is used in applications requiring better corrosion resistance and transverse properties compared to other similar martensitic grades. Strength and toughness desired can be altered by temperate range in the heat treatment process.